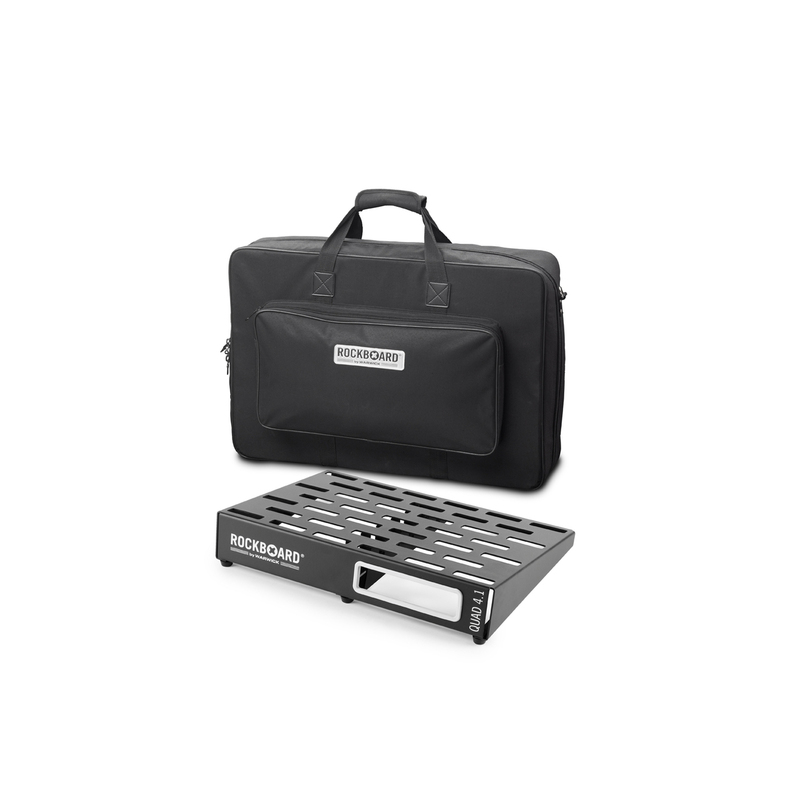 The RockBoard QUAD 4.1 Pedalboard with Gig Bag is designed to be lightweight, rigid and rugged, and allows for the use of a multitude of pedals as well as power supply mounting solutions. Its uniquely ingenious construction is based on only one folded, cold-rolled aluminum sheet for the board frame and has not a single welded seam. This makes the board surface completely plain and gives you more pedalboard space for your money. U-shaped vertical support braces offer additional stability without adding too much weight. RockBoard pedalboards will neither bend nor wiggle. The innovative slot-based design works equally well with the new RockBoard Quick Mount pedal mounting plates (sold separately) as well as with standard mounting solutions (e.g. hook and loop tape, cable ties). The slots also let you easily hide cables underneath the surface for a neat and tidy setup. Additionally, any power supply can either be mounted underneath the board surface, or using the optional RockBoard The Tray universal power supply mounting solution. This model is compatible with the RockBoard MOD patchbays. – weight board 1.5 kg / 3.31 lbs. – approx. weight of bag 1.5 kg / 3.31 lbs.